Home » Blog » Why Don’t You Follow Up?! That’s the question I have for three different vendors who are seeking business from me and my family right now. One is an appliance sales and service provider. Another is a backyard playset manufacturer. And the third is an RO water softener company. In all three cases, I have been provided with a quote or initial service call. In all three cases, I am eager and willing to spend money with the vendor. And in all three cases, the vendors are not calling me back. This lack of follow up is maddening to me. Why? 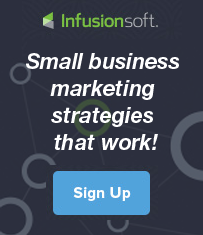 Because our purpose at Infusionsoft is to help small businesses succeed. And the No. 1 way we’ve found to do that is by improving follow up in the sales and marketing process. When small businesses consistently follow up during the sales and marketing process, their sales soar. When they don’t, their sales struggle and the company is in jeopardy of dying. Scott and I had a conversation on an airplane seven or eight years ago. We were talking about the fact our software can do so much—the fact that it can automate many parts of a business. As a result, some customers get lost in all the software can do and they lose sight of the basics. I was passionately advocating that if our customers would automate their follow up with new leads and customers, they would double their sales. Scott pushed back on my assertion. I held my ground. Ever since then, we have watched closely and we’ve found my assertion to be true: if you consistently follow up with new leads and customers, you will dramatically increase your sales. We have thousands of success stories to prove the claim. And that’s why it drives me crazy that these three vendors won’t follow up with me. Sure, I want the services they offer. But I want these small businesses to succeed. And I know they are unlikely to achieve success if they don’t follow up in the sales process. SBS Idea of the Day: Where are you failing to follow up with prospects who are inclined to do business with you? After sending a quote? After an initial consultation? After they fill out a form on your site? Do yourself a favor and find one place where you’re failing to follow up and fix it. Today. Clate Mask CEO and Co-Founder Clate has been educating and inspiring entrepreneurs for over a decade, and is recognized by the small business community as a visionary leader. His passion for small business success stems from his personal experience taking Infusionsoft from a struggling startup to an eight-time Inc. 500/5000 winner. As CEO, Clate is leading Infusionsoft on its mission to create the small business success platform. Under Clate’s leadership, Infusionsoft has landed four rounds of venture capital including a $55 million Series D led by Bain Capital Ventures with contributions from prior investors, Signal Peak Ventures and Goldman Sachs. He was named an Ernst & Young Entrepreneur of the Year finalist, a Top 100 Small Business Influencer by Small Business Trends, and one of the 100 Most Intriguing Entrepreneurs of 2013 by Goldman Sachs. Clate is a national speaker on entrepreneurship and small business success, and co-author of the New York Times bestseller Conquer the Chaos: How to Grow a Successful Small Business Without Going Crazy.